By Aaron Au and Alvin Kor This video is also published on SCMP at http://bit.ly/1NDEHy0. Read full story by SCMP reporter at http://bit.ly/1SKEI3f. Operation Santa Claus, the city's annual fund-raising campaign jointly organised by South China Morning Post SCMP and RTHK Radio 3 Hong Kong. By Arisa Lai and Julianna Wu. Charity IDEAL (Intellectually Disabled Education and Advocacy League) help people with intellectual disabilities and their families through training courses, education activities and provide them with community support. This video is also published on SCMP at http://bit.ly/1XSqpej. Read full story by SCMP reporter at http://bit.ly/1Nfrt6M. Operation Santa Claus, the city's annual fund-raising campaign jointly organised by South China Morning Post SCMP and RTHK Radio 3 Hong Kong. By Herbert Cheung and Sharon Tang. Kids dressing in red from Discovery Mind International Kindergarten raise cash for OSC through a charity walk. This video is also published on SCMP at http://on.fb.me/1SxYBdR. Operation Santa Claus, the city's annual fund-raising campaign jointly organised by South China Morning Post SCMP and RTHK Radio 3 Hong Kong. By ShanShan Kao, Tanya McGovern and Crystal Tse. Eighteen-year-old Paralympic dressage star Natasha Tse Pui-ting gets the feeling of running on a horse. This video is also published on SCMP at http://bit.ly/1TnL1dC. Check full story at http://bit.ly/1IvBScv. Operation Santa Claus, the city's annual fund-raising campaign jointly organised by South China Morning Post SCMP and RTHK Radio 3 Hong Kong. By ShanShan Kao and Viola Zhou. From a hearing impaired family without speech, these children with full hearing or impaired sing their Christmas wishes using both verbal and sign languages. This video is also published on SCMP at http://bit.ly/1Q7nr4T. Check full story at http://bit.ly/1XqvAHu. 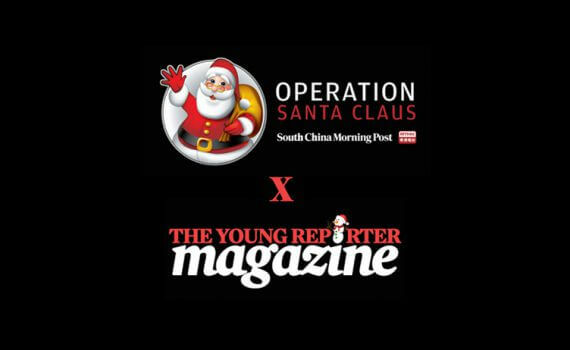 Operation Santa Claus, the city's annual fund-raising campaign jointly organised by South China Morning Post SCMP and RTHK Radio 3 Hong Kong. By Christy Leung and Viola Zhou. Sailability offers people with disabilities the opportunity to face new ocean-borne challenges, and sportswoman eyes Paralympics. This video is also published on SCMP at http://bit.ly/1lTQTQK. Check full story at http://bit.ly/1XCAImp. Operation Santa Claus, the city's annual fund-raising campaign jointly organised by South China Morning Post SCMP and RTHK Radio 3 Hong Kong. By Tsui-see Au Yeung and Joanna Wong Ho-yan. Participants build and drag homemade cardboard sleighs at first Operation Santa Claus Sleigh Ride Challenge. This video is also published on SCMP at http://bit.ly/1NiDdVn. Operation Santa Claus, the city's annual fund-raising campaign jointly organised by South China Morning Post SCMP and RTHK Radio 3 Hong Kong. By Catherine Chen and Sharon Shi. Wing Ding participants dress up for the tournament playing 11 non-stop squash games in a bid to raise HK$1 million for the Operation Santa Claus charity campaign. This video is also published on SCMP at http://bit.ly/1HDdI5a. Read full story at http://bit.ly/1NFPxVX. Operation Santa Claus, the city's annual fund-raising campaign jointly organised by South China Morning Post SCMP and RTHK Radio 3 Hong Kong. By ShanShan Kao, Iona McNab and Charlotte Yang InspiringHK Sports Foundation funds classes to help children relieve stress and acquire winning qualities so they can climb the social ladder. Discover more about the fencing classes at http://goo.gl/VfRBWx.